Since working at Trek, I have been hounded to get a new bike, even more so than by my friends in Portland when I lived there, and EVERYONE has like 5 bikes there. So, I finally decided to pick up a new bike, a Trek 7.2 FX, Newport Blue, 22.5 inch. It’s a Hybrid – not a road bike, not a MTB, but somewhere in between. Some pictures are here, of the bike building process, because when you work at a bike company, you take 25 minutes of out of the day to build a bike. So what other parts are there to this equation? The app of course. RunKeeper Pro. 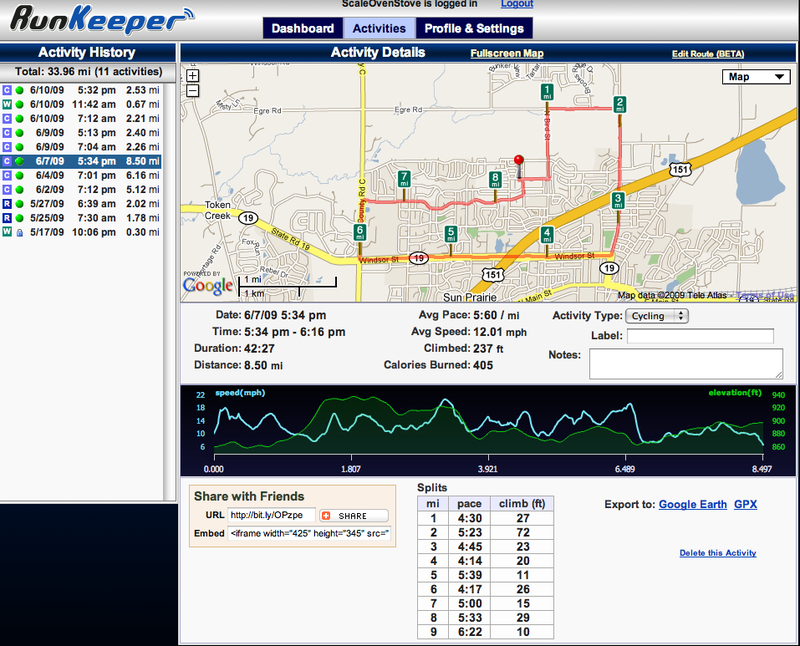 (http://www.runkeeper.com) It lets you set your activity type, you start the music before you start RunKeeper, lock the GPS on, and start your activity. You can “lock” the screen so you dont bump it, and then tap it to get pace/speed info. It will also tell you every 5 minutes and/or every mile what your speed/pace is. Once you are done with your activity, you upload it to their site. It maps it out, elevation, speed, nice google map interface. Aggregates miles over weeks/months, and lets you share with your friends. RunKeeper really keeps you motivated. I haven’t used Nike+, but I am guessing it is pretty similar. But Nike+ doesn’t work on the iPhone, just iPod Touch. I really like my bike, there was a Gary Fisher I had my eye on though, so maybe that will be my next bike. Using my iPhone and RunKeeper, I can keep track of my rides, miles, and share with my friends (which kind of helps you stay motivated too). Fun Stuff – Go By BIke!